Who doesn’t love to find a personal note from someone special in their mailbox? At Zazzle the options for customization are numerous. And the designer papers to choose from will boggle the mind! If you love blue flowers, or know someone who does, a little note card – with or without text – will please the recipient. The blue hydrangea gives these folded notes a lovely look, and if you’d like a larger card, it’s easy to choose the larger “greeting card” size. 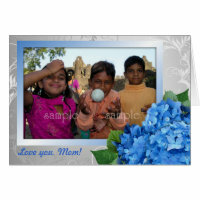 We even have photo cards so you can further personalize your greeting with a picture! Every card comes with a white envelope but we have custom envelopes available too.